GIORGIO ARMANI suit in a navy blue wool with brown multi pinstraipe pattern includea a two button, notch lapel sport coat and flat front dress pants. Made in Italy. Category: Suit. Fabric: Wool. Color: Navy. Shoulder Seam to Shoulder Seam: 18.5". Shoulder Seam to Cuff: 25". Size: 40 Regular. Pants waist: 34" 2" to let out. Single breasted 3 button jacket has besom chest pocket; 2 front flap pockets; 3 interior pockets; 3 button cuffs; No Vents, notched lapel. 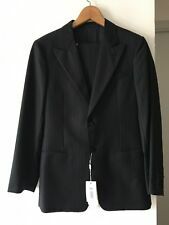 GIORGIO ARMANI ITALY DESIGNER MEN'S BLACK PINSTRIPE BLAZER SPORT JACKET 42R NWT! Notched lapels, fully lined (2 lining pockets), no back vents, 2 buttonhole style pockets in front. Made in Italy. Original sold at Saks 5th Ave.
Color Way : Charcoal Grey. Pleat Front Pant. Material : 100 % Wool. Lining Color : Grey. Rise : 12 ". Size : 44 L / 37 W. Sleeve Length : 26". Pit to Pit : 23 ". SIZE: 52B, “36 x 32”. COLOR: Dark Gray with Purple Pinstripe. STYLE: Made in Italy 100% Wool Three Button Suit with Dual Vents. CONDITION: Preowned/Used with the jacket in very good condition but the pants have wear on the fly and right Pockets shown in the last two photos. Size is 38R. Double breasted peak lapels. 1980's / early 1990's. Overall, the exterior of the suit is in excellent condition, no stains or tears. Measurements: Chest 24 x 2= 48 Length 31.5 Shoulder to shoulder-19 Very good exellent condition. Comes from a smoke and pet free home. Please feel free to email me with any questions. Thank you for your business. Have a great day! Save a fortune by buying here. Pants waist: 34" with 2" to let out. Pants inseam: 27" with 1" to let out. Pants have a double-pleated front and are lined to the knee. 23" sleeves with 2" to let out. 20 " shoulder. Condition is Pre-owned but in excellent condition. Shoulder to shoulder: 19.5”. Inseam: 31”. Waist: 19”. This is the Sartorial line of Giorgio Armani. single plaid. 100% Virgin Wool. Single breast 2 button. length 29". as the Blazer is a size 38US and the Trouse is a 40US. size 38US 48IT. Armani Collezioni. Saks Fifth Ave. Black / Grey Pinstripe Original. Color : Dark Blue/Light Blue Pinstripe. Pleat Front Pant. 2pc 100% Wool Suit. Material : 100 % Wool. Size : 42 L / 34" - 35" W.
A nice quality suit, Mani by Giorgio Armani. 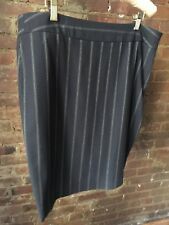 Dark charcoal color with pinstripes, double breasted, 3 pocket front, and no vent. Previously owned showing light signs of wear. Arm from should to end of sleeve: 24.5". Pattern: Pinstripe. Material: 100% Wool; Lining: 100% Cupro. Color:Dark Gray. Waist: 42". Shoulders (seam to seam): 20". Material: 100% Pure Wool. Waist of Jacket (Across Upper Button):43". Length (Top of Collar to Hem):32". Condition: This item is inGood Pre-Owned Condition ! There areNO Major Flaws with this item, and is free and clear of anyNoticeable Stains. There is a hold in the pant leg. See the picture to see it. GIORGIO ARMANI Super 150's Wool Blazer Sport Coat. Every item is thoroughly inspected and professionally cleaned if required. Dual Rear Vents. 100% Super 150's Wool. Sleeve length (top shoulder seam to cuff): 26". MANI by Giorgio Armani Blazer Sportcoat Suit Jacket. Black Triple Pinstripe. Lining: 100% Rayon. Blazer by Armani Made in Italy. Notched Lapel, Dual Vent, 100% Wool. Feast Your Eyes On The Many Pictures As A Picture Speaks A Thousand Words. Size: Jacket: 42L, Pants: 35X34. PANTS: Pleated, Fob pocket, cuffs. As much as I would like to think otherwise, I am not perfect and have made mistakes in the past and will very likely occasionally do so in the future. : Giorgio Armani Black Label. Design: Thin Stripes. Color : Black w/ Gray. What good is a great deal if it's on a knockoff?. Three Interior Pockets. Three Exterior Pockets. Three Faux Buttons on the cuffs. • Shoulder to shoulder: 19”. • Shoulder to hem length:30.5”. • Waist: 19". • Black with light pinstripe. • Armani logo lining. • Made in Italy. 100% wool - Super 120 - light weight material - very delicate -- single pleat - dual vents. The pants were originally 38 and have been altered to 36. chest (size 44 4 ex) 48. chest (size 45 3 ex) 48. Pattern - Pinstripe. Blazer Pockets - 3 Exterior / 3 Interior. Material - Wool. C. Jacket Waist - 44". Color - Black. D. Length - 32.5" (From bottom of collar). Our accolades are as followed E. Sleeves - 26" (With 1" to let out). Pattern: Pinstripe. Weave: Worsted?. Trouser Style: Pleated. Number Of Buttons: Double Breasted. Trouser Lining: Partial. This ensures that all of our suiting has consistent sizing across manufacturers and eras. Leg opening: 9". -Armpit to Armpit: 23". -Sleeve length: 25". -Pant waist: 18". -Length from neck seam: 31". -Shoulder width between seam: 19.25". -Inseam: 31". Point to Point (Shoulder to Shoulder): 20. Color: Grays and Green. Sleeve (Shoulder seam to end of sleeve): 25.75. Cuffs: N/A. Inseam: 33 & 5/8th with 2.5 to lengthen. Waist (across): 19, with. 75 to let out. Designer: Giorgio Armani. Color: Gray Pinstripe. Material: 100% Pure Virgin Wool. Jacket: Fully lined. 2 button front. 3 button sleeves. Notched lapels. 3 exterior pockets which are still sewn shut. Made in Italy! Beautiful suit for any occasion, in slimming, tailored fit. Spare buttons, hem tape included, hanger is not included. THE JACKET HAS 2 VENTS. 100% Virgin Wool. 4 button double breast closure. Length from collar seam: 28". Shoulders: 18 3/4". Elegant peak lapel. THIS IS A GIORGIO ARMANI CLASSICO SIZE 42R GRAY 2 BUTTON WOOL SUIT. Pleat Front Pant. Material : 100 % Wool. Color Way : Navy Blue. Size : 42 R / 37 W. Waist : 37 " ( Can be let out about 2 " if needed ). Lining Color : Blue. Pit to Pit : 22 ". Length : 30.5 " ( Inseam Can Be Let Down 2 " if needed ). Material : 98% Wool 2% Polyester. Waist: 34". Waist (Button): 21 ". Sleeve (Seam to Cuff): 25". Inseam (Crotch to Hem): 30". Most used Shirts, Jackets, Sweaters, Coats, etc will typically have wear on cuffs. Chest (armpit to armpit): 22”. Shoulder seam to shoulder seam: 19”. Length: 31.5". Armani Collezioni Modern Men's 2 piece Suit 40R, Grey With Double Pinstripe. Condition is Pre-owned. Shipped with USPS Priority Mail. 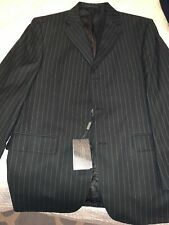 This Giorgio Armani suit is in great, pre-owned condition. Rise:13 Material:Wool/30%Silk. The pants have about 1.5" of room to be let out. Shoulder to Cuff:26. Double Breasted Excellent pre-owned condition. Double Breasted. 100% Virgin Wool. The shirt and tie are for display purposes only and are not included with the suit. pleated front pants with cuffed hems. Jacket is fully lined. Peak Lapels. shoulder: 19 1/2". Single breasted 2 button jacket has besom chest pocket; front welt pockets; 4 interior pockets; 4 button cuffs; side vents, notched lapel. Sleeve - finished fake button holes. Giorgio Armani Mens Navy Pinstriped Suit 40R 33/29” (30.5). Super sharp suit.